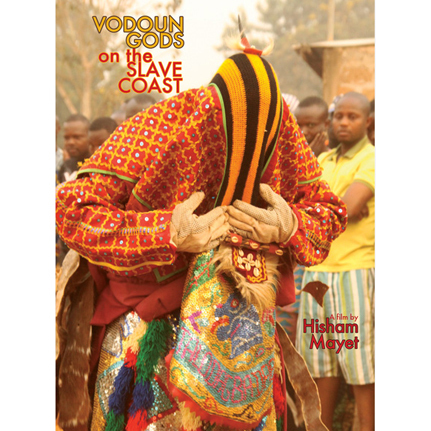 Vodoun Gods On The Slave Coast explores the ceremonial splendor of sacred dance and ritual in Benin, the birthplace and cradle of Vodoun. Formerly known as Dahomey, Benin was also called the Slave Coast due to its importance in the trans-Atlantic slave trade. Today, the worship and supplication of Vodoun gods remains integral to everyday life in Benin. Shot in January 2011 during the country's rich annual Vodoun celebrations, this film offers an impressionistic glimpse of the major ceremonies and delirious musical performances associated with this ancient religion. Guided by the otherwordly rhythms and colors of Vodoun pageantry, Mayet presents an intimate view of metaphysical dramas enacted in magisterial costumes: The cult of Sakpata, fearsome god of pestilence, disfigurement and healing. The Egoun-goun, ancestral visitors from the realm of the dead, who bring blessings and warnings for the living. And the Zangbeto nightwatchmen, ambulatory haystacks who serve as Vodoun’s secret police. Traveling in a malarial fever dream from the clutter and bustle of village markets to the palace of Ahosu Agoli-Agbo Dédjalagni, the King of Abomey, Mayet provides an unforgettable portrait of secular and sacred life in Benin. Digipack with 12 page booklet of photographs from various Vodoun ceremonies throughout Benin; 48 minutes/color; all-region DVD, NTSC format. Limited one-time edition of 1,000 copies.